Have rock climbers turned from environmental crusaders into an environmental menace? "Climbers aren't just dirtbags ... it's mainstream now, and they're doctors and lawyers that drive SUVs and have credit cards"
OWENS VALLEY, California — Kevin Creager sits at a low-slung wooden picnic table in the Bureau of Land Management’s Pleasant Valley Pit campground, just north of Bishop at the northern end of the dry and windswept Owens Valley. It’s a standard agency-issued table — bulky and coated with too-thick dark-brown paint. But there’s nothing standard about “the Pit,” as it’s affectionately known around here. Witness Creager, who is camp host. A 28-year-old self-proclaimed rock-climbing junkie, with long dark hair, a deep tan and a placid face, Creager is a far cry from the retirees with poodles and RVs who usually staff such places. He’s spent the entire winter here, camped in a tiny BLM trailer, keeping tabs on the campers, but also climbing on — and collecting — rocks. Littered on the picnic table is his collection of smooth river stones, pocked chunks of black lava, an animal skull and several tins filled with more rocks. Around Creager’s trailer, there are no shady trees to shelter tents and tables, no gurgling streams making music for happy packs of Cub Scouts. The Pleasant Valley Pit is a gravel mine, scooped out of the earth and sometimes still active as a mine during the summer off-season. On this April evening, 30 or so trucks, cars and tents are scattered across the otherwise barren floor of this steep-walled basin, and more perch on its rim. Looking around, I remark that “the Pit” is a rather bleak spot. “People aren’t here for the camping,” says Creager. “They’re here to climb.” If Yosemite’s Camp Four was home base for the early cadre of rock climbing pioneers, such as Warren Harding and Royal Robbins, the Pleasant Valley Pit is the launch pad for a whole new generation of rock jocks. The new pioneers include Chris Sharma and Lisa Rands, who have both earned titles in world climbing competitions. But these climbers aren’t here to scale the snow-cloaked Sierra Range that rises abruptly to the west, or explore the blocky White Mountains to the east. A few of them come for the famously difficult sport climbing in the nearby Owens River Gorge, but most of them are here to boulder. Bouldering isn’t complicated. It’s nothing more than climbing around on rocks — from gently rounded boulders to steep, undercut caves — while staying relatively low to the ground. This means that if you fall, you probably won’t kill yourself, so you can try all manner of gravity-defying moves without bothering with ropes or protective gear. It’s the latest trend to take hold of the rapidly changing sport of rock climbing, and it’s bringing astonishing numbers of people to the rocks around Bishop. A longtime climber myself, I’ve been itching to take a spin around this rocky jungle-gym. But I also know that the bouldering boom is changing the town of Bishop, and challenging the land-management agencies that must keep the clambering hordes from wrecking a fragile desert landscape and its extraordinary prehistoric rock art. I’ve come to take a close look at this area, but I also have a bigger question about the culture of climbing and the future of the environmental movement. In the past, climbers occasionally left the mountains to lead the battles to save those mountains. But as climbing shifts from the peaks to boulders and indoor rock gyms, will it continue to incubate the environmental leaders it once did — like climbing pioneers John Muir and David Brower, who also fought to save mountains, rivers and forests? Or do “quiet recreationists” like us represent the West’s next environmental menace? Just 30 miles down the highway from Bishop is Independence, a rough-around-the edges town of sagging false-front buildings and low-budget motels. The Eastern California Museum here displays local mountaineering legend Norman Clyde’s ice ax, skis and ratty old rope. Clyde, one of the Sierra’s most prolific climbers, pioneered hundreds of routes in the early 1900s, using hobnailed boots, a hemp rope and soft-iron wedges called pitons that he pounded into cracks in the rock. “We always get climbers stopping through in the summer to bow down and worship at his shrine,” says museum specialist Beth Porter. Even before Clyde took to scrambling up the Range of Light’s granite spires, John Muir — who later founded the Sierra Club — was one of the first to reach the top of nearby Mount Whitney, in 1873. Muir and Clyde were followed by other mountaineers, at first in a trickle and then in increasing numbers. In the late 1960s and early ’70s, a wave of climbers came to the Sierra to summit the high peaks and crack-split sheer walls. Then, in the 1980s, sinewy, Lycra-clad “sport climbers” opened up a whole new world of climbing in the Owens River Gorge, where the river has scoured through hundreds of feet of volcanic rock. They used power drills to punch trails of bolts into steep cliffs, opening up previously untouchable lines where pounding pitons or using removable protective gear weren’t options. “The Gorge,” now arguably the most extensive sport-climbing area in the country, is home to over 600 routes that draw thousands of climbers from around the country each year. Later in the day, I grab my climbing shoes, chalk bag and copy of The Bishop Bouldering Survival Kit, and drive a few miles down the dirt road to the area’s most popular bouldering spot, the “Happy Boulders.” About 25 cars fill the parking pull-out, which, during the busiest days — Thanksgiving, Christmas and spring break — can be packed with three times as many vehicles. Inside a small canyon nearby, I join other climbers wandering around the rocks like lost tourists, road map-sized guides flapping in the breeze. But it’s obvious where the bouldering is: Clutches of climbers are gathered at the base of rocks, and rock-lined trails thread off in all directions between boulders splotched with white gym-chalk, which climbers dust on their hands for a better grip. In some places, not a blade of grass survives the trampling. After a long winter, I’m feeling more like a banana slug than a sticky-footed gecko, so I start on something easy. I circle the girth of a house-sized rock that’s full of tiny pockets and protrusions. Then I head farther into the canyon, looking for steeper slopes and bigger holds. At one severely overhanging rock, a throng of guys is gathered. A half-dozen crash pads — thick, padded mats used to keep a climber’s bones intact if he or she falls — litter the ground. While one guy climbs, the others stand below, arms outstretched, ready to break his fall if he peels off. Occasionally, someone drags a pad or two across the dirt to match the climber’s movement above the crowd. I’ve been rock climbing for 12 years, but I’m amazed by what I see. 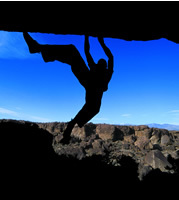 One climber starts from a sitting position in the dirt and pulls himself from the ground, placing his feet on tiny nubs on the rock. As he moves higher, he kicks one foot up almost over his head, hooks his heel in a deep pocket, and deftly levers up the rock. In one fluid movement, he lunges through the air, both feet swinging from the rock. He grabs a high, rounded hold and pulls himself with one arm to the crest of the boulder, feet windmilling before they find purchase. The crowd below cheers. “It’s just like being on the playground jungle-gym as a kid,” grins one guy. The next climber gets halfway up the rock and stalls. Before he falls to the ground, through groans and grimaces, he gasps, “This makes my eyeballs feel like they’re going to fall out of my head.” But the climbers keep lining up to try it again. If there’s one man Bishop can thank for making the town the center of climbing’s latest fad, it’s local guidebook author Mick Ryan. A jovial transplanted Brit, Ryan penned The Bishop Bouldering Survival Kit and hosts a Web site dedicated to marketing the sport here. Ryan says that while his boosterism has helped bring climbers to Bishop, he’s not entirely responsible for the visiting herds. “The town’s been put on the map by the national and international press,” he says one afternoon, as he darts between his computer and the dining-room table in his tidy bungalow just off Bishop’s Main Street. For that, too, Ryan can be thanked. Back in 1997, he helped write the first article about Bishop’s boulders ever to appear in a national climbing magazine. It was a timely piece of PR. At about the same time, a Texas state park known as Hueco Tanks, just outside of El Paso, was working on a plan that would virtually close its gates to climbers (see story this page). Hueco Tanks had been the bouldering hot spot during the winter months, and “climbers were looking for a new place to go,” says Ryan. Bishop had everything to draw the winter climbing crowd – sunny desert weather and lots of rocks. Soon, the trickle of boulderers into Bishop became a tidal wave. Next door, the Kava Coffeehouse is abuzz with climbers. One of the guys who works there has just successfully climbed “the Specter,” a smooth granite rock with just a few miniscule edges that’s reportedly one of the hardest boulder problems in the country. A knot of French climbers at the counter wants to track him down for the first-hand story. “It’s not unusual for people to drive across the country just for one problem,” another patron tells me. Across the street at the Rubber Room, cobbler Tony Puppo, who moved to Bishop in the 1970s for the Sierra’s granite crack climbing, says he resoles 3,000 pairs of climbing shoes a year. And climbing shoes are all he does. “We do more volume in just rock shoes than we used to do in both hiking and climbing shoes combined,” he says. But not everyone is courting climbers. “Some businesses realize the potential, but people are still a little wary of the scruffy youth,” says Puppo. Motel and restaurant owners are more likely to mention fishing as their biggest moneymaker. The town caters to swarms of fishermen; opening day is called “Fish-mas.” Mule Days is another biggie; the event draws nearly 40,000 people and 700 mules to town for five days of riding, jumping and packing competitions. No one can say exactly how much money climbers pump into the economy. But in a town where 70 percent of the sales tax comes from tourists, it’s an important piece of the pie. And climbers have helped put the squeeze on an already tight real estate market. “For a while, it seemed like every other person looking to rent or buy a place was a climber,” says Realtor Michael Johnston. Local climbers warned the Bureau of Land Management “that a tsunami was coming” as the first guidebook and magazine articles went to press, says agency recreation specialist Joe Pollini, whom I meet in the BLM’s second-story, dark-paneled office in Bishop. But, he says, the onslaught was far greater than the agency expected. 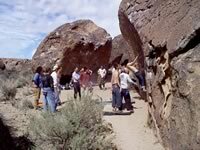 In 1999, the first year the BLM kept track of the numbers, 7,000 climbers visited the Happy Boulders. This year, the agency expects nearly 18,000. With 750,000 acres and only $180,000 a year to spend managing recreation — which includes everything from camping and climbing to off-road vehicle use — the BLM’s Bishop district is stretched thin. Initially, climbers parked, pitched tents, built campfires and relieved themselves anywhere and everywhere. The BLM reacted quickly. Within three years, agency staffers had hauled in porta-potties, cleaned up the Pit and turned it into a campground, marked trails and enlisted a volunteer climbing ranger (nowadays paid) to monitor the area and press the flesh with visitors. But perhaps the most effective management strategy has been to put a kink in the flow of information about new climbing areas. BLM officials say they have a “gentleman’s agreement” with guidebook and Web site authors like Ryan. Ryan, who gave the agency a heads-up before he published his guidebook, says that he’s agreed not to “spray” about areas on BLM land that contain sensitive wildlife and cultural sites. What about all the other rock-climbing writers, exercising their First Amendment rights, who might slip beneath the agency’s radar? “It’s a concern of ours,” says the BLM’s field office manager, Bill Dunkelberger. “Anybody could move in and say, ‘Wow, what a great opportunity,’ and market places we don’t necessarily want marketed.” But Dunkelberger says that, so far, peer pressure from within the climbing community has kept any guidebook mavericks in check. To see what’s at stake, Dunkelberger, archaeologist Kirk Halford, climbing ranger Scott Justham and I pile into one of the agency’s shiny SUVs and drive to several areas that they hope to protect from becoming overrun by climbers. We’re on top of the Volcanic Tablelands, not far from the crowded Happy Boulders, but it seems like we’ve traveled light-years. We’re the only people here. Riotous dots of yellow and purple flowers peek from the sage and bitterbrush that’s greening after a wet winter. As we hike past low cliffs and scattered rocks, Halford points out the tiny bone fragments and obsidian chips that litter the ground, left behind by the ancestors of the Paiute tribes. “A lot of the caves and overhanging rocks that boulderers are looking for are also where prehistoric people liked to live,” he says. Just beyond is a rock panel covered with large circles and a figure holding what looks like two spears. Archaeologists say that the area has the highest concentration of rock art in the Great Basin, with about 88 archaeological sites per square mile, many of them in good shape. As we head back to our vehicle, however, we notice chalk marks on boulders near some of the rock art, the telltale sign that climbers are taking an interest. Later, I talk to Qwina West, a member of the Bishop Paiute Tribe, which has an 875-acre reservation that borders Bishop to the north. He says his people consider many of these areas sacred, and use them for gatherings and ceremonies. He worries that climbers could overrun some sacred sites. The agency has yet to draw any hard and fast lines, however. Staffers had considered seasonally closing nearly 1,500 acres adjacent to the most popular bouldering sites, after they discovered that raptors — which once used the area for courting rituals, nesting and hunting — had disappeared. The closure would have affected hikers and off-road vehicle users as well as climbers. But under pressure from the climbing community and the Access Fund, a national group that works to keep both public and private land open to climbing, the agency opted for a voluntary closure (see story this page). Staffers have installed a pressure-sensitive counter on the road leading to the area, and say that only a small number of vehicles are now using the road. But even as rock-climbing soars in popularity, some wonder: Are there Browers in this new crop of young climbers, or is it just another group using the West’s public land as its personal outdoor playground? Many of these folks spend more time in indoor climbing gyms than they do in the mountains. Back at the Pit, I go looking for answers. “Who’s David Brower?” is the response I get from Dustin and Ryan, two San Diego teenagers making kindling for their campfire by busting up pallets that they’ve lifted from behind a grocery store. I talk about Brower’s battles against logging and dams, and ask him if climbers are still strong environmentalists. They seem incredulous that I’ve posed the question. I’m not impressed, but a couple of kids does not a generation make: I know plenty of twenty- and thirty-something climbers who care passionately about the places where they play, and work hard to protect them. One evening, as the sun sinks behind the backdrop of the Sierra’s jagged spires, I sit on top of a blonde, house-sized boulder with longtime climber Bob Harrington. Harrington, a lanky, understated man in his 40s, grew up in the Bay Area and started climbing on Sierra Club outings as a teenager. After dropping out of college, he spent a number of summers living out of his van and climbing in Yosemite, before returning to school and eventually settling down in Bishop to work as a hydrologist. The rock we’re on is in what’s known as the Buttermilk Country, across the Owens Valley from the Happy Boulders. From our perch, we have a bird’s-eye view of the trails threading through the scattered granite boulders and a few dirt roads that dead-end at campsites. The Buttermilk Country, a place frequented by climbers for decades, has recently been “rediscovered” by young climbers. I ask Harrington if he thinks climbers will be able to keep this area from turning into an industrial playground. He says that, so far, the land looks to be absorbing the impacts, but with the soaring numbers, he wonders for how long. But Harrington is an optimist. He tells me that he thinks that climbing still pulls in “the same pool of young, liberal kids” who will eventually come to appreciate the land on which they’re playing. “Every generation has had their faction that makes the older generation shake their head,” he says. But, “I see a lot of environmental consciousness in young climbers. You see this in the climbing areas; they’re very clean. Things like limiting trail use — we were never conscious of that before, and now people are.” Maybe these tough boulders will infuse a generation of climbers with a conservation ethic akin to Yvon Chouinard’s and David Brower’s. And maybe they’ll come into town from time to time to fight for these wild places. Then again, maybe not. The evening chill drives us off the rock and we climb down to make our way back to the car, passing a large undercut rock where, earlier that week, I’d watched a knot of post-college-age kids tackling a difficult boulder. They had flown or driven from both coasts to rendezvous with old friends and pit their skills against some of the diciest climbing problems anywhere. The guys in the group lined up to give the overhanging rock a try, while a girl in a purple coat, holding a shivering, sweater-wearing chihuahua, snapped photos. When I asked one of the guys to tell me about the best part of his day, he told me about the “burly problem” that he “stuck” on his first try, and about all the rocks that have perfect finger-sized edges and pockets. Robyn Morrison writes from Paonia, Colorado. - Climbers: More than just fun-hogs? The Access Fund 303-545-6772, www.accessfund.org.